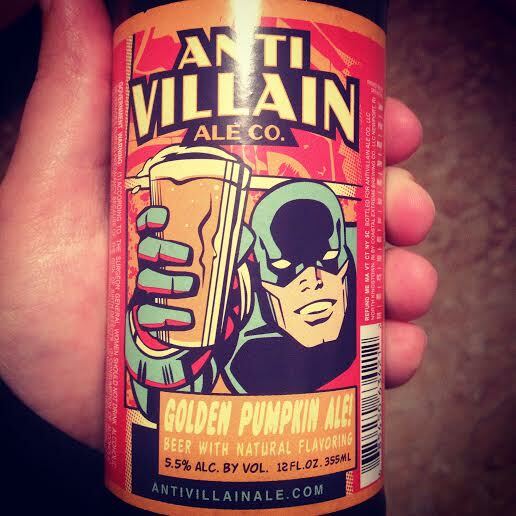 Up now, Dave Burke’s guest review of Anti Villain Ale Co. – Golden Pumpkin Ale! Aroma – a vague clove-y/ginger hybrid. Bit of vegetation. Mouthfeel – Thin and dry. Slight astringency on the finish. Taste – Lots of dry, bitter vegetation. A hint of spicing, but nowhere near the degree most breweries strive for these days. Overall – While I appreciate the cause of such a progressive brewery, a better beer may generate more revenue. Befitting their appropriately inked-in label of a superhero, this new brewery is acting out in support of clean water projects by donating 50% of their profits to fund these projects directly. I love noble causes and I love beer – already, I want this ale to vanquish it’s competition. Pouring a bright sunshine orange, this ale has a scent heavy-laden with sweet pumpkin and spicy cinnamon. With a light body, two different cinnamons and a whole bag of nutmeg come across surprisingly heavy-handed. The nutmeg, in particular, lingers bitterly far past the rest of this golden ale and it’s welcome. This ale is in a fledgling stage of discovering it’s own identity as a crime-fighter. It needs to pick a cause beyond basic spicing, and go big in that direction.